Elvis first recorded this number at home in 1966 and this home-recording was issued on "Platinum: A Life In Music" in 1997. The studio recording, however, was made at the American Studios and was originally released almost 20 years earlier on the "From Elvis In Memphis" album—perhaps the very best Elvis album. 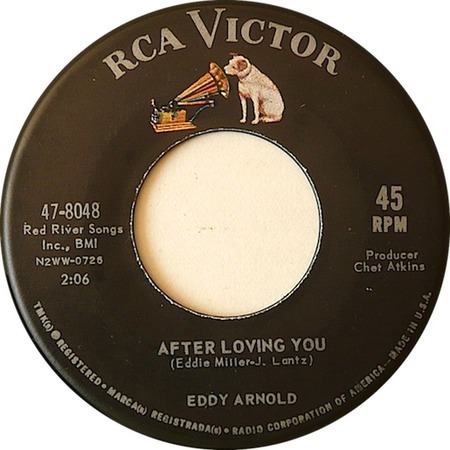 It is reported on some sites that Eddy Arnold recorded his version of "After Loving You" on 4 May, 1962. His recording was released on RCA Victor single 47-8048, as the B-side of "A Little Heartache," in July of that same year. joe hendersons version was on Todd 1077. Although this recording was released in 1962, the exact recording date is unknown. Eddie Miller, the writer of this number, also wrote "Release Me."